I needed forty feet of cloth-covered cord for the Prairie Skin in order for each side to have two ten-foot cords. I suppose I thought that if one took the trouble to make a wrapping cloth for a human body, it ought not to come unwrapped. So, I needed 40 feet of bias strips of cloth to make the cords. I cut bias strips: All I had to do was sew the bias strips together into ten foot lengths . I knew I didn’t want to be paralyzed by indecision so I used the John Cage method: I took advantage of chance by throwing all the strips into a box, mixing them up and drawing them out one by one. I used 3/32” cotton cording to make the cords, having tested, and rejected, 1/2” cording, 3/8” cording and 1/4” cording. I chose the cording method where you sew the fabric (inside out) around a cord that’s twice as long as what you need and then turn the fabric right side out upon itself along the empty cord. Turning a foot of cord inside out is easy. Turning ten feet of cord inside out is not. I have a high capacity for tediousness* but I now regard any activity that requires the use of non-slip gloves AND locking pliers to be very close to drudgery . “Blessed be the tie that binds” goes the hymn we sang at one of those Wellesley College chapel events we had to go to. These ties may not be blessed but they were hard won. A journey of a thousand buttons begins with a single button . . . but it’s still 320 buttons. (Eight terrain squares x 40 buttons per square [20 front; 20 back] = 320 buttons). I have all the tools. “Cheater” needles (self-threading) and Thread Heaven thread lubricant and “finger cots” and a thimble and locking-pliers for when the fabric is painted or heavily stitched and it’s nearly impossible to pull the needle through. I sew five times through the holes, then make a knot, then wrap the thread five times, then make another knot, then knot again. Current score: 25 buttons done; 295 to go. to the heartbeat of what comes next, what goes on for its own sake. The page after the last page, on which we do not appear. And that is part of the solace of repetitive labor—I sit still but my memory ranges. Between panic and peace, I sew one button . . . . Sometimes another button follows. Orfield Lab’s anechoic chamber, a three-dimensional sound “sponge,” is the quietest place on Earth. It is designed to keep out all external sound and extinguish all reverberation. When immersed in such silence, we hear our heart, breath and blood and conjure up music and voices that sound real. It seems we can replace the echo chamber with the anechoic chamber but we can’t get rid of the reverberations of our own memories. The irony doesn’t escape me. Our capacities for remote sensing increase daily. Nothing is beyond our digital and disembodied grasp: the floor of the ocean, the depths of Antarctica, the surfaces of Mars, even our own lives, as bots scour the web for information for (and about) us. We are captivated by what we see on the screen. And also, held captive by it—bound and contained in spite of our limitless reach. Forgetting to look at—much less hear, or smell, or touch—what’s around us. In my mapping, I don’t want to just mark and measure. I don’t want to just declare a boundary and represent distance. I want to touch, to hear, to empathize, to connect. I want to be embedded. Enmeshed. Immersed. I want to understand, as a human, the human landscape that is built and cultivated and divided and also the natural one. I also want to understand landscapes that flow and accrete, landscapes that change suddenly but also slowly and imperceptibly, landscapes whose diversity and fragility are often invisible. I want to use touch to communicate, use sound to orient and navigate, use sight to document and investigate. So I’m doing a kind of sensing. But it’s local, not remote. Visceral, not mechanical. Last year I drove from Lincoln (Section 52 in my grid) to Scottsbluff (Section 37) to give a workshop as part of Picturing Nebraska. As usual, I took the long way round—3 days and 629 miles. Leaving Sidney (Section 62) for Kimball and going west on Hwy 30, I saw Sidney Draw on the map. Having drawn Sidney Draw I decided to explore it. Prairie Skin, a work in progress, is a life-size, reversible, pieced and quilted construction which is large enough to wrap a body. Part of my Mapping Nebraska project, this piece is informed by my travels across the state and my memory of its prairies and grasslands. I remember my first art teacher’s teacher telling me about a nomadic tribe whose cradles (carried on their backs) functioned also as “portable shrouds” because so many infants died. I want this Prairie Skin to also be portable and to have multiple functions: shelter and shroud, commentary and covering, record and map. I’m mapping Nebraska: making a stitched, drawn and digitally imaged cartography of the state where I live. Locating myself. And the viewer. Trying to understand the place where I am. Locator Map. 15′ x 5′. Graphite on Tyvek. 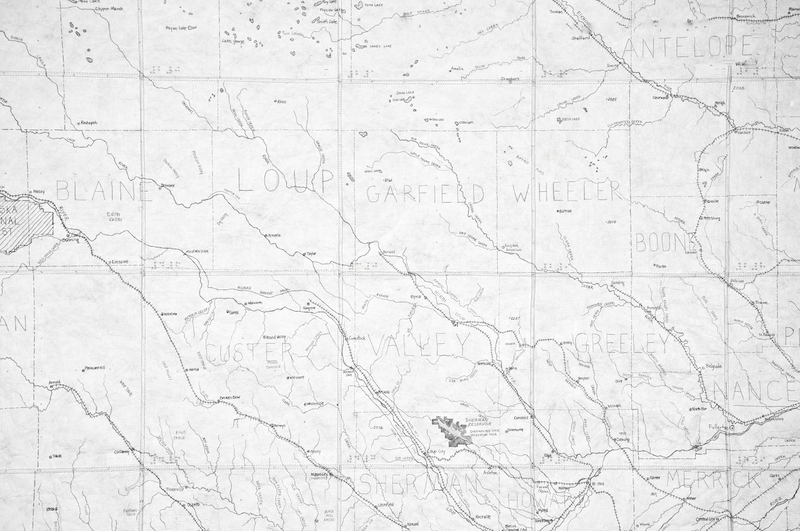 I began by drawing all of Nebraska—95 squares stitched together to form a 15-foot Locator Map. My map records physical features—lakes and rivers creeks—and geographical features —railroads, parks and towns—and all are to scale (1″ = 2.75 miles) and in their correct relative position. It’s as accurate as I can make it. I created this map of Nebraska for some of the same reasons we’ve long used maps—to see where I am relative to the other places, to get a sense of my surroundings and to try to comprehend a whole I can not see. The Locator Map tells me about borders and boundaries—county lines and standard parallels and the extent of the Nebraska National Forest and how far, in relative terms, Antioch is from Ellsworth. It gives me a geographical overview. It lets me know, if I’m drawing the area around Gaunt Lake, that I’m north of Oskosh and East of Alliance, in Sheridan county.